We’re nearly there. The end of seemingly endless January. And it’s not been too awful, considering. Normally January is a clone of December, minus the parties, food, presents, fun. But, at least here in the UK, it’s not been too bad. Not bad at all: no snow to speak of, glorious crisp light, mild verging-on-balmy temperatures, and a gradual lengthening of day that is apparent to all but the most dreary of people. Yesterday I overheard a gaggle of older ladies moaning about the dark days and the “bitter, bitter cold”. I felt like reminding them that we have almost 2 hours more light than on Christmas Day, and that 10 C is pretty darn warm for the time of year. We actually have colder summer days. It is very possible that these women are the same ones I hear complaining loudly about the July heat, while wearing tweed coats and hats. If you live in Edinburgh, you know what I’m talking about! Other than the instant balm of a cheering cup of tea, one thing that might brighten these ladies up is a nice plate of cauliflower cheese. But perhaps not as I’ve done it. They might not approve of the unorthodox method, nor the perky topping. And that’s fine. 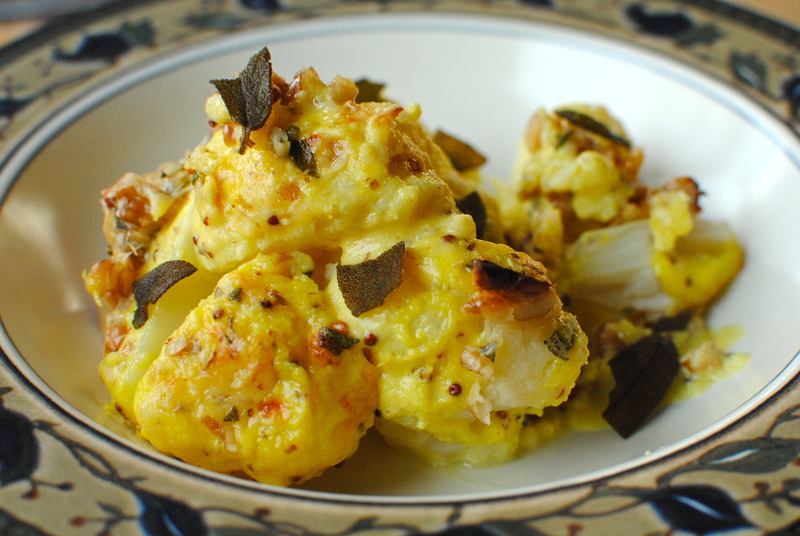 There is nothing wrong with a plate of traditional cauliflower cheese. Except that I don’t really like it all that much. Well, I like a few bites of it and then want something with a bit more dimension, whether in texture or taste. I have confessed to being a bit of a sensationalist, preferring layers of flavour rather than something one-note, however nice. Cauliflower cheese falls into the latter category. I know, I know, it’s got nutrition superstar cauliflower in it. As the main ingredient. But still, all that cheese, butter and blah colour doesn’t exactly inspire or excite. Basically, despite eating cauliflower perhaps twice a week, sometimes more, I rarely make cauliflower cheese. Even though when I do it’s always this cheats’ method, so at least it’s not just a vehicle for saturated fat. But I recently had a brainwave of sorts. Not like one that, say, Stephen Hawkings or Archimedes would have. That really would be something. Rather, that mixing together calmative sage and heart-healthy walnuts might be nice. And it really is. So much so that the test batch was wolfed down by my family before I could take enough photos. Always the sign of a decent recipe in my house. 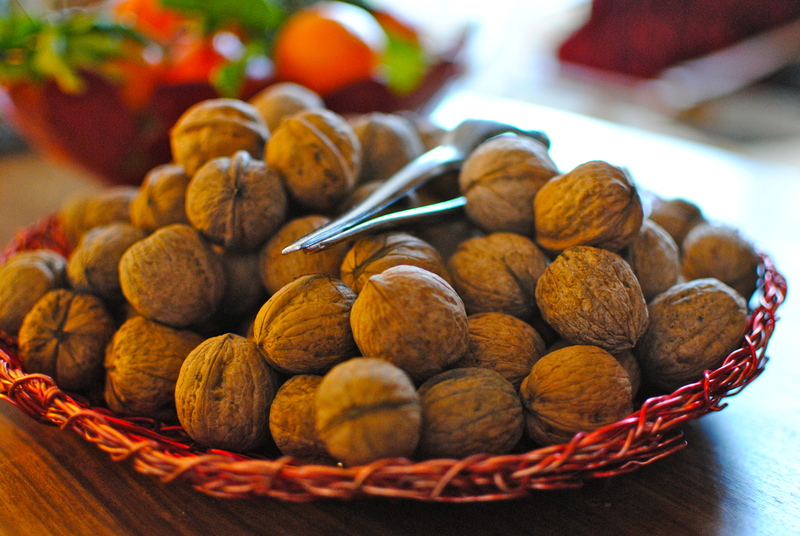 heart-healthy walnuts: eat the papery skins too! Of course if you are vegan this particular recipe won’t be suitable. But Angela over at Vegangela has some scrummy looking cauliflower recipes, whether or not you do dairy. One of my favourite side-dishy ways with cauliflower is to toss florets and stem in a little plain olive oil and sprinkle with my beloved za’atar, chillies, turmeric, or even just a scatter of sea salt, then roast at 180C, for about 15 minutes, until tinged with brown and gold. Unlike with the dreaded, stinky boiling, roasting takes away the slight bitterness that some folk hate, leaving a subtle almost nutty flavour. Sometimes I squeeze over a little lemon or chuck on a tablespoon or two of Parmesan cheese as it comes out of the oven. Truly delish and oh so simple. This recipe is simple too. Like the pleasures of seeing the first crocuses noseing through the frozen earth. If only some people would notice. 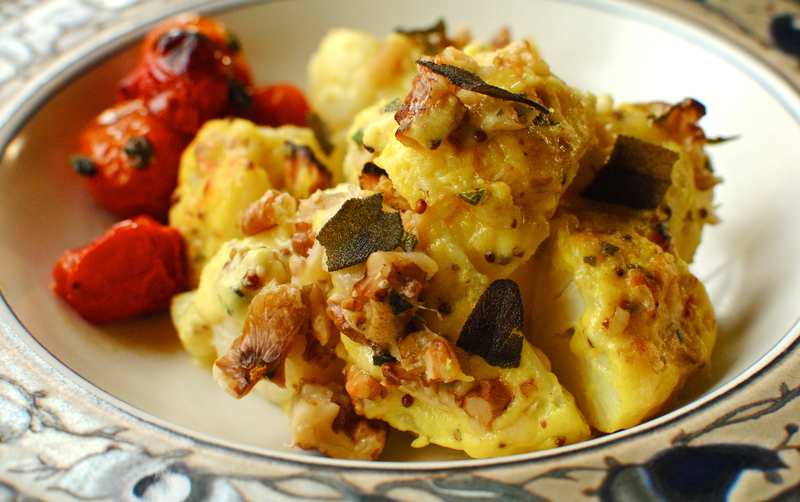 The scant but culinarily effective duo of fresh sage and walnut elevates cauliflower cheese from ho hum to hip hooray. I might exaggerate a tad, but if I were the type to throw dinner parties, I would not be ashamed to include a great spoonful of this on each plate. It makes a quick light meal on its own with a crisp salad, or something more substantial when paired with lemony grilled fish and roasted vine tomatoes. You could even mix it into cooked pasta. And don’t worry about the missing butter and flour, the crème fraiche and hard cheese ‘magically’ create the perfect sauce. A little less fat and no gluten – no bad thing. 100g freshly grated mature/sharp cheese such as Cheddar, Manchego, Gruyere or Red Leicester (plus 4 tablespoons for finishing the dish). Use lower-fat cheese if you like but perhaps add more mustard to make up for the non taste. 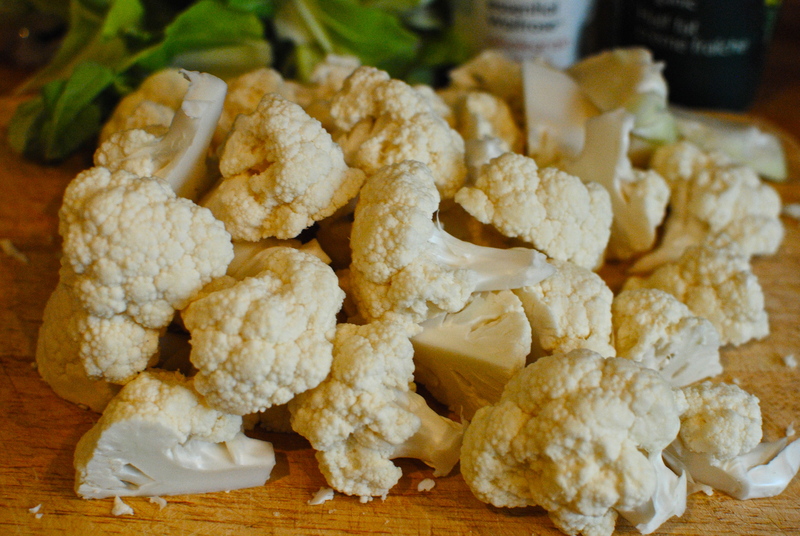 Steam the cauliflower pieces for about 10 minutes – longer if you need your food to be quite soft. While the cauliflower is cooking put the crème fraiche in a medium saucepan over a low heat and let it ‘melt’ a bit before stirring in the cheese, turmeric, mustard and pepper. Whisk or stir the developing sauce as it thickens – no flour required! Taste it for seasoning and adjust if needed. You may want more mustard, for example. In a small bowl, stir together the sage and extra cheese. 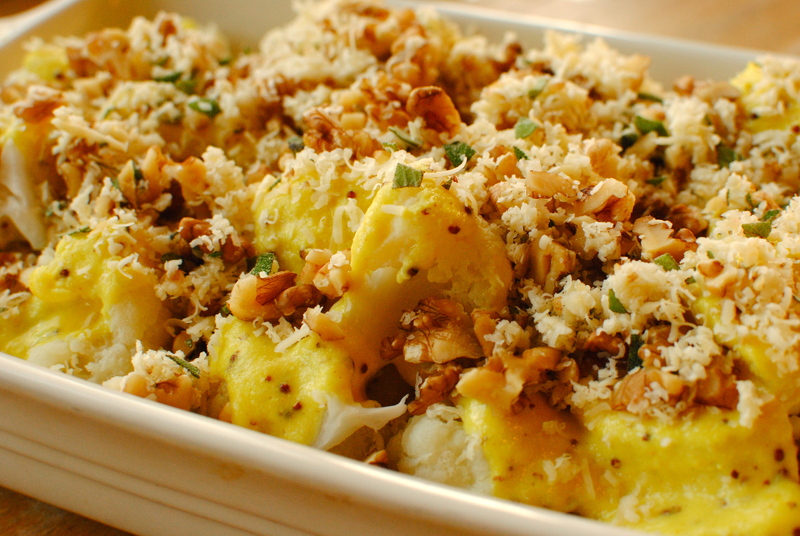 Put the cooked cauliflower in a suitable gratin-type dish and pour over the cheese sauce. Sprinkle on the walnut pieces and top with the sage and cheese. Pop the dish under a medium hot grill until the sauce bubbles and the walnuts are browned a bit – one to two minutes. Serve immediately. I’ve topped the dish with crumbled olive oil-fried sage leaves for extra crunch. Serving for one: use a small cauliflower, or even 200g cooked from frozen, and half the sauce. Leftovers? Use the leftovers as the basis of a quick soup, whizzed into hot vegetable stock and heated through. Delicious! Soft food diet? Whiz up the walnuts until a suitable texture for you, before adding in the sage for another second or two. Cook the cauliflower to your liking and roughly mash if required. I’m so glad I’ve ordered some organic cauliflower for tomorrow! I was wondering what I will do with it…well, problem solved! Can’t wait to start cooking!Thanks Kellie! Delicious! And so simple! We made it yesterday, and it turned out wonderfully! Fantastic, Kasia! I don’t often get recipe feedback, just that someone might make something or other (which is fine by me, of course), so very gratifying that my instructions gave a good result for you. Thanks for coming back and commenting. I really appreciate it. What a gloriously wonderful recipe Kellie and I love the addition of the walnuts, which would suit is right now as we have a lot to get through from last Autumn. It is also a pretty dish to bring a smile to the faces of the diners at this drab time of year! Kellie, this cauliflower cheese sounds divine. I love a lower fat cauli cheese and would not be afraid to eat a good plateful! I usually roast cauliflower with a splash of olive oil and a sprinkle salt and pepper. 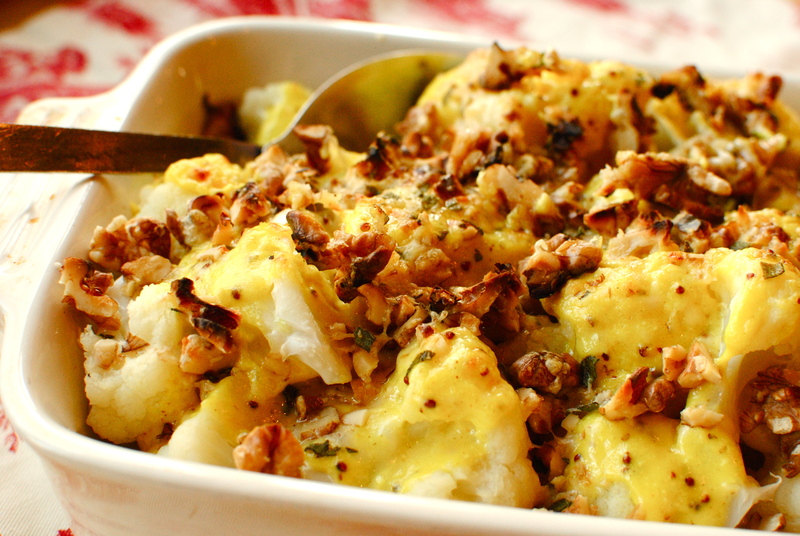 But creamy cauliflower with sage and walnuts would be lovely for a special dinner! I usually do the same, more of a side dish thing than a main, but I think this is nice when I’m wanting a little comfort food with a healthy fillip. But roasted cauliflower is actually my favourite ‘everyday’ (although not literally) way of eating it. Can’t do cheese all the time 🙁 Thanks for commenting, Deb. Btw me being featured on ‘freshly pressed’ (front page of wordpress.com) gave me the incentive to do a blogroll and I’ve included you as one of my favourites. Love your ideas. I will definitely prepare this recipe for my bunch of friends. It seems a very complete dish. What would you serve on the side? A salad?! Needysweety, Bella, Zoe! GET READY for dinner! Thanks for your kind comment. I think I mentioned roasted tomatoes, or for something more substantial serve as a side with grilled fish. Quick, under-30 minute meal! I don’t often make cauliflower dishes. It’s crazy not to since it’s such a healthy and inexpensive vegetable. I’ll be adding this to my must make list. Thanks Bianca. I’m surprised – & pleased- so many people seem to like tofu. I hope you try it. This is an amazing recipe, sounds so comforting and delicious! SO glad I’ve started following your site. Beautiful recipe! Hi Kellie, I just got back from vacation and am catching up on my blog reading. This winter has been so strangly mild for us, we’ve barely had any snow here either (I’m in the snow country of NY). No matter what the temps are outside, I could eat this delicious dish any time. The walnut and sage were lovely additions! Thanks Faith. I hope you had a great holiday, and that you get some seasonal snow – if you want it that is. This sounds a very interesting way to use cauliflower. What would you suggest for someone who does not eats nuts or who is not intollerant. Some great recipies though. Hi Tony. I would say fresh breadcrumbs mixed with a little olive oil, plus the sage. How does that sound? great great way to use cauliflower! im one of those people who like veggies anyway so I’ll even gladly have it plainly boiled, but i really do love that addition of spice, and sage. I agree a great way to use cauliflower in a recipe! You know it’s heart health month so this is perfect, esp with the addition of walnuts! 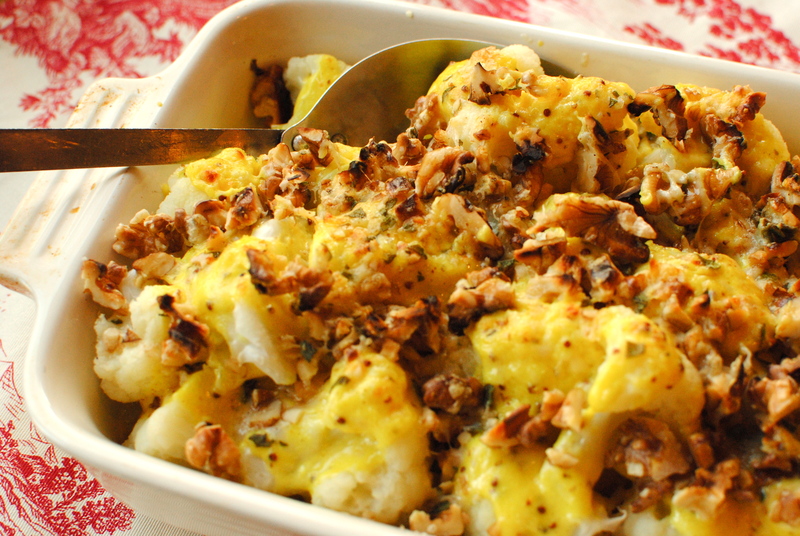 cauliflower, cheese, sage, and walnuts = fabulous. And I love your positive outlook on things. Yum! I havent’ bothered to make a flour/butter/milk type cheese sauce for ages – but this I shall make again, and again. Oh great – so glad you liked it 😀 Not making a ‘proper’ cheese sauce is very freeing, isn’t it? There’s a place for bechamel but I don’t think cauliflower cheese has to be one of them. 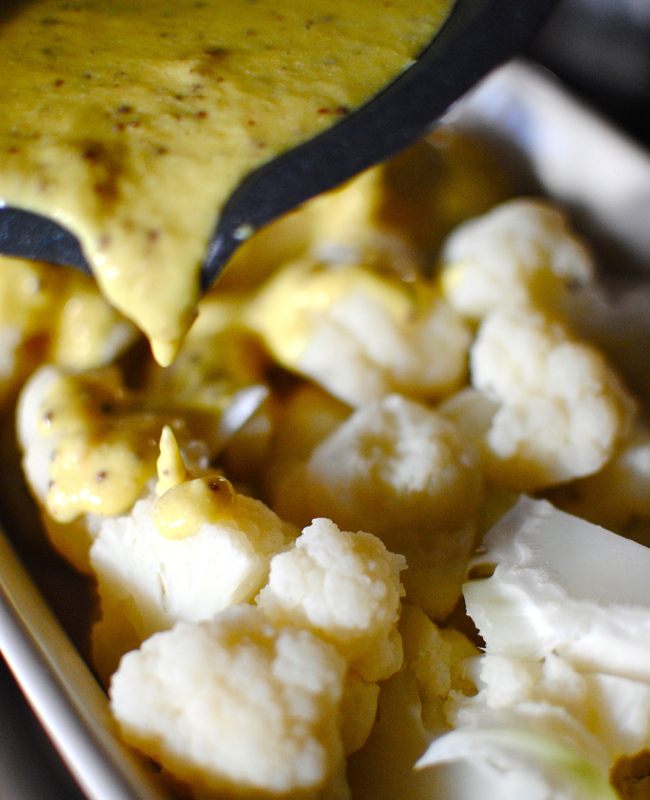 Oh wow – how there’s a combo I’ve never thought to try with cauliflower – love it! Thanks for the inspiration. Cheers! It is definitely a grey day comfort food.